Foster parents: Jeff and Terri B.
Morena was left at a shelter at the age of five when her owners could no longer afford to give her the proper care. She was anxious and timid in the chaotic environment of the shelter, so GSRNE was called and asked to give her another chance in life. 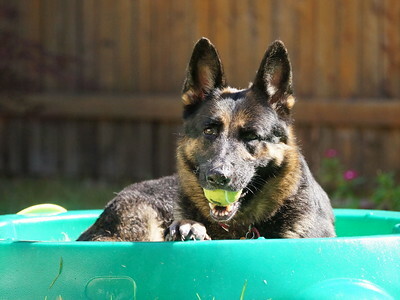 In her foster home, it took about two weeks for her true personality to start to emerge, and we’ve been delighted to see what an absolute sweetheart she is. 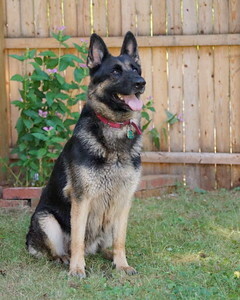 Morena is sensitive and loving and has a strong desire to please her owner; she loves tennis balls and Frisbees and is very proud when she catches a ball in midair. 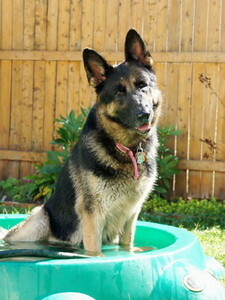 She has her own kiddie pool and loves to sit or lay in it on warm days; she also enjoys having a bath and being brushed. Morena had had little or no training when she moved into her foster home, and she would focus on digging for rocks when out in the yard. She would startle quickly at loud noises and attempt to hide and stay still for several minutes, so her foster parents have been working to build her confidence and keep her focused on toys and exercise. She’s been learning basic commands and responds well to the mental stimulation, structure and daily activity in her life now. In the evenings, Morena just wants to relax and hang out with her people after an active day of going for walks and playing fetch in the yard. She’s comfortable staying in her crate at night or when her family has to go out, but she’s always up for a ride in the car or joining in on a family activity. If you can provide a loving home and calm environment, consistent leadership and would look forward to bonding with this beautiful girl, please ask us about Morena.